Home Prices Rise At Best Pace In Seven Years : The Two-Way The housing sector remains one of the U.S. economy's bright spots. In major cities across the nation, prices in July were up a bit more than 12 percent on average from a year ago. This home was under contract last month in Chicago. Led by more strong gains in Las Vegas, San Francisco, San Diego and Los Angeles, home prices in major U.S. cities were up just more than 12 percent on average in July vs. July 2012, according to the latest S&P/Case-Shiller Home Price Indices report. 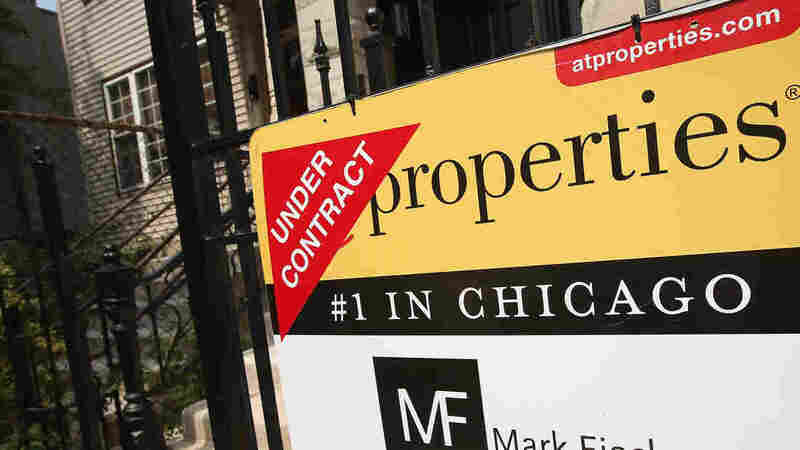 The average increase was the largest since February 2006, Reuters adds, and is yet another sign that the housing sector is among the economy's strongest sectors. But David Blitzer, chairman of the index committee at S&P Dow Jones Indices, suggests in the group's report that coming months may look less strong: "Following the increase in mortgage rates beginning last May, applications for mortgages have dropped, suggesting that rising interest rates are affecting housing." More news about the economy is due at 10 a.m. ET, when the private Conference Board releases its look at where consumer confidence stood in September. The Conference Board says its consumer confidence index slipped to 79.7 in September from 81.8 in August. Economist Lynn Franco, who directs the board's work on the index, says in its release that "concerns about the short-term outlook for both jobs and earnings resurfaced, while expectations for future business conditions were little changed."